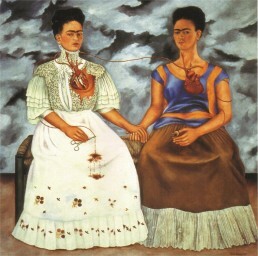 Of the many self-portraits Mexican artist Frida Kahlo painted, the work entitled “The Two Fridas” remains one of purveyors’ absolute favourites. 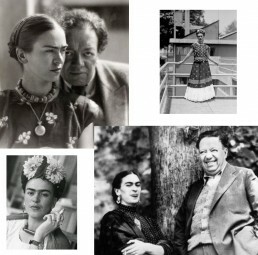 It is her largest painting, and Frida created it at the same time her husband, Diego Rivera, was divorcing her. With just that small bit of context, it becomes very apparent what Frida was feeling at the time and the overall meaning behind the piece. On the left side of the portrait sits Frida with her dress torn open to reveal a broken and bleeding heart, signifying the pain she was experiencing from Diego rejecting her. In her hand, she holds a pair of bloody scissors. On the right side of the portrait, the viewer sees Frida before the divorce–when Rivera still loved her. Her heart is whole and her face shows no distress. In her hand, she holds a tiny portrait of Rivera. Interestingly, the real-life tiny portrait featured in this painting was later discovered amongst Frida’s belongings and can now be seen at her art museum in Mexico called the Museo Frida Kahlo in Mexico. Still looking at the painting, you can observe a lot of small details that help further tell the story of Frida’s suffering. Both versions of Frida sit on one bench, holding hands in front of a dark, stormy backdrop. The main artery runs between them, connecting both of their hearts together. On the left, it can be seen running down in front of Frida to the scissors in her hand where she has cut it off, and is now in danger of bleeding out. When Frida first painted this piece, she initially wrote in her diary that it was inspired by an imaginary friend she had as a child. It was only much later on, perhaps after she had somewhat recovered from the emotional struggle of the divorce, that she admitted her divorce is what inspired her to create it. While it is now a highly acclaimed work, she only received about $1,000 for it (4,000 Pesos) while she was alive. It was sold to Mexico City’s National Institute of Fine Arts. This painting marked the most expensive painting she ever sold during her lifetime, but since then, many of her works have went on to become well-loved within the art community. Her paintings explore topics such as gender, race, class, and identity, and since she used naïve folk art style while drawing on Mexican popular culture of the time, her style remains highly admired to this day.